The Vietnam War : fully resourced, free samples below. 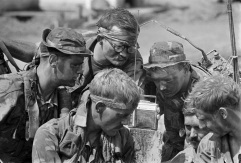 A comprehensive unit covering the causes, process and consequences of the Vietnam Conflict. Highlights : Design and defend your tunnel. Investigation : Why did the USA 'lose' the Vietnam war? Students aged 14-17. Ideal study / revision aids for GCSE and IGCSE students. AQA , Cambridge, OCR and Edexcel. Also a good foundation for AS Edexcel study. 50 page PDF download sent to your mail within 24 hours. Content: Key words, Ho Chi Minh, Nationalist or Communist? , Why did the USA get involved in the Vietnam Conflict?, The Domino Theory and Containment, The role of Ngo Dinh Diem, The burning monk, Military comparison, Who were the Viet Cong? , Defend your tunnel, Design your tunnel, The Tunnels Rats, Was the TET Offensive a turning point in the war ?, An interview with General Giap, The My Lai Massacre, What was Vietnamization?, Propaganda, Vietnam war statistics, Investigation: why did the USA lose the Vietnam war? Timelines, Review, Puzzles,, Cartoon analysis templates, Essay writing frames, Powerpoint review, Flipped learning activities.